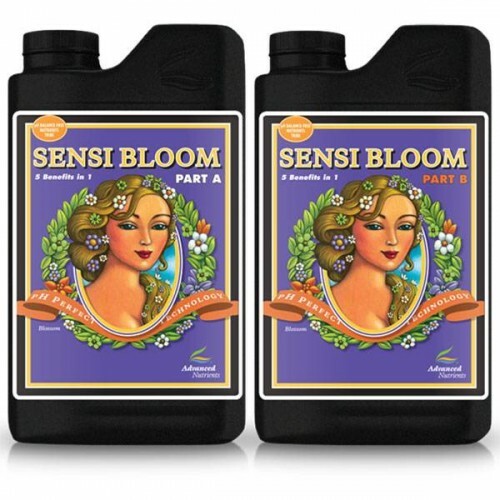 Advanced Nutrients Sensi Bloom A&B is scientifically tested and designed to enhance your blooming phase with larger more robust crops and yields. You can count on this 2 part system to create the most profound crops that taste good and smell wonderful. Use Advanced Nutrients PH Perfect Sensi Bloom to balance the PH level consistently throughout the entire blooming phases and will develop heartier and larger floral and crop development. Inherent in the Advanced Nutrients Sensi Bloom are the needed hamates, fulvates, chelatins, L-Form Amino acids, phosphorous, Potassium, Nitrogen and surfactants needed in rapid development of floral and crop growth and yields all in one bottle. All 16 compounds needed for full floral and plant structures found naturally on Earth are all balanced and tested to give you constant perfect levels of each. Dosing Instructions: Proper dosing throughout blooming weeks from week 1-6 use both A and B equally at 4ml per 1 Litre of medium. Advanced Nutrients Sensi Bloom is a part A and B system to give you larger, heartier and more potent crop yield throughout all hydroponic gardens. Advanced Nutrients Sensi Bloom gives maximum nutrients and regulation to the plant feeding process and creates larger and more robust crops with more essential oils for potency. During gardening you can use multiple types of medium such as soil or hydroponics and reap the rewards of healthier plant life and better crop yields. Advanced Nutrients Sensi Grow A&B has been scientifically formulated to be considered the only “..